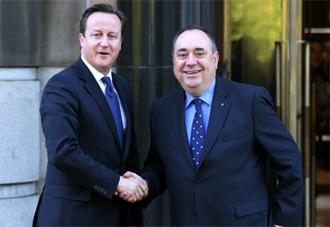 Reagrupament International wishes to congratulate Mr. Cameron and Mr. Salmond for their capacity to reach agreements by means of dialog. It is a sad circumstance the Spanish state has neither the capacity nor the will to dialogue. Thank you very much in the name of all oppressed nations! I passionately believe in the United Kingdom. I don’t just believe Scotland would be better off in the United Kingdom. I think the rest of the United Kingdom, England, Wales, Northern Ireland, is better off with Scotland in the United Kingdom. My argument will also be to English people and Welsh people and Northern Irish people, as well as to Scottish people.